We can be brief about the attacks of September 11, 2001 in the United States. That was an inside job, organised by the illuminati. It was yet another example of the "Problem - Reaction - Solution" tactics (1), which the elite have so often used to create support among the public for certain actions - most of the time a war. 1) You secretly create a problem and blame someone else for it. 2) Then you wait for the inevitable reaction from the public, which will demand retaliation. 3) Now you bring forward a solution, which will allow you to execute your plans and which the public will accept without asking questions. The Reichstag fire in 1933 (which led to the Nazi-state of Adolf Hitler), the attacks on Pearl Harbor in 1941 (which led to the participation of the US in World War II) and the Tonkin-incident in 1964 (which led to the Vietnam war) are examples of these tactics, and there are many more (2). The controlled media only report what they have been told by the government, and are often instructed what to tell the public beforehand, for optimum effect. Whilst the truth behind these events is completely different. In some cases, like the Tonkin-incident and the alleged weapons of mass destruction in Iraq in 2003, they are even made up completely. As we now know, the 9/11 Attacks led to two new wars, all kinds of "anti-terror" measures which led to many restrictions of civil liberties worldwide, and massive earnings for the arms and oil industry. But the biggest profit was probably the fear for new terrorist attacks among the world population, especially after the illuminati also orchestrated attacks in Madrid, London and other places. The collapse of the North Tower of the World Trade Center in New York on September 11, 2001. Right in the foreground we see Building 7, that also collapsed like a house of cards, over six hours later. But this building wasn't attacked. According to the government report, the cause was "a fire caused by burning debris from the WTC"
The proof that this was an inside job is overwhelming. Most people have no knowledge of this however, because the mainstream media hardly reports anything about it. Furthermore, people have a tendency to want to protect their world view as they know it, so when confronted with "conspiracy theories", they would rather ignore them. They simply don't want to believe that their government is capable of deliberately killing its own citizens, only for gaining more money and power. Because if you believe this, what does that mean for your sense of security and safety? For most people this is just too hard to swallow, and the elite know it. That's why they get away with it every time. All across the world, the black boxes from an airplane crash have always been retrieved. With only two exceptions: those from the two airplanes that flew into the towers in New York. Miraculously, what they did find in the rubble was a passport from one of the alleged hijackers! The Twin Towers were specifically designed to withstand an airplane impact. The heart of the towers consisted of massive steel columns. Apart from the fact that an explosion cannot produce enough heat to melt steel, let alone a fire (3), the massive steel columns were pulverised. 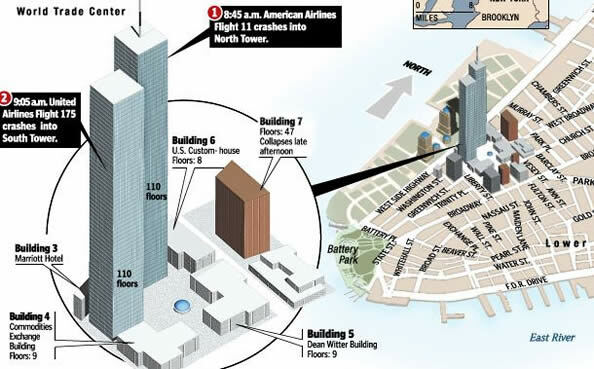 And not only on the floors where the plane hit the towers, but all the way down to the ground. In the rubble, Danish analysts found traces of explosives (4). Two blocks away from the Twin Towers, another building collapsed into its own footprint, over six hours later on that same day. It was called the Salomon Brothers Building, or Building 7. However, an attack never took place on this building. 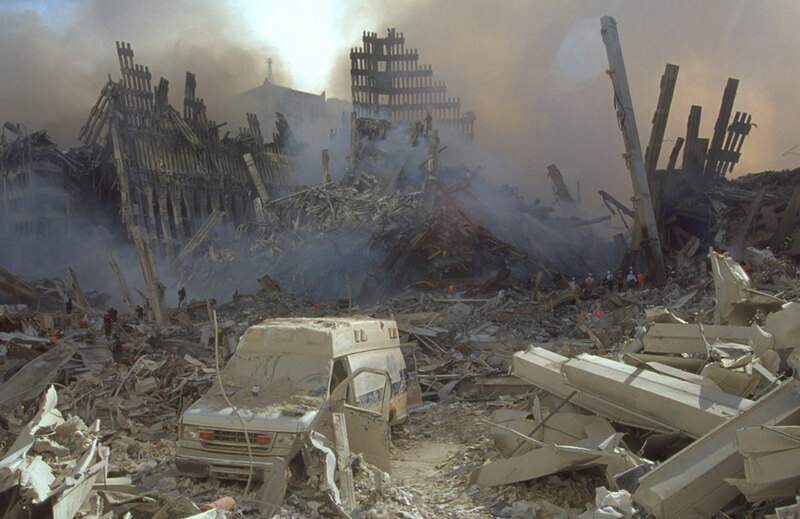 The official report concluded that the collapse of Building 7 was due to fires caused by debris from the Twin Towers. There's only one thing we can say about that: look at some videos on YouTube of burning buildings (1, 2, 3) and then a few videos on controlled demolitions (1, 2, 3). And then decide for yourself what the collapse of Building 7 (1, 2) looks like most. Even the most convincingly written government report can't change these images that say it all (5). 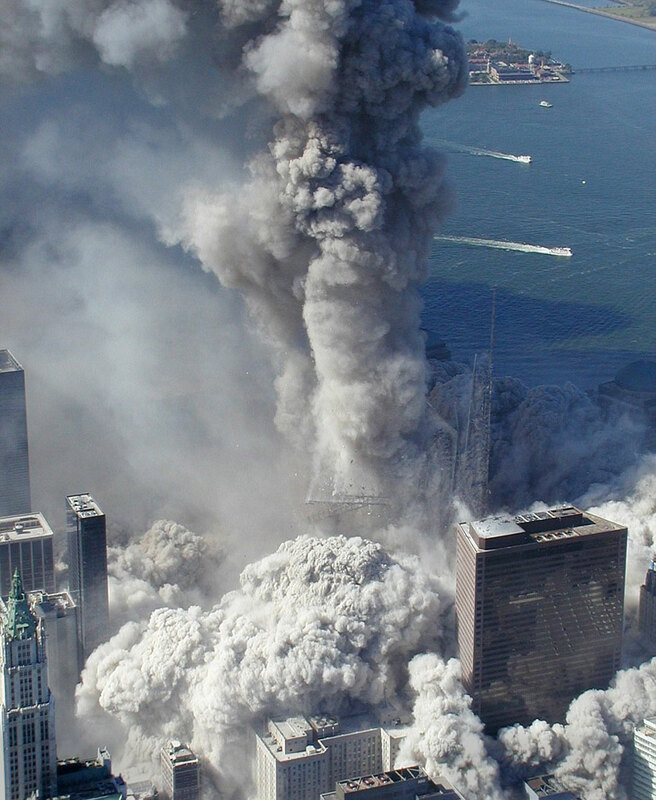 The tv images show the towers collapsing at the speed of a falling stone. Normally this would be impossible, because their steel frame and concrete floors should slow this down. But it did happen, and this means that both towers weighing 500,000 tons each, should have hit the ground with a massive impact. However, this did not happen either. Seismic observations hardly showed any signs of activity. The basement under the towers was still intact, and after most of the rubble was cleared, the so called bathtub, a concrete base from which tall buildings are built up, was still in a perfect state. Also, the amount of rubble raises questions. After such a collapse, there should have been a pile of rubble of about 15 floors high, but this wasn't the case by far. From the top 100 floors, actually almost nothing has been found at all. No desks, no phones, no human bodies, nothing. It seems like they went up in dust before they even reached the ground. And what made it even stranger: in the wide area of the two towers, up to a mile away, dozens of parked cars went into a spontaneous combustion. Researcher Dr Judy Wood came to the conclusion that only vibration techniques which the great inventor Nikola Tesla worked with at the beginning of the previous century and which have been patented, could be capable of something like this (7). The many applications of these ancient techniques, including the building of pyramids, form one of the secrets that are kept within the freemasonry. Every inventor that tries to take it into the public domain, like Royal Rife and Dr Hulda Clark who used this frequency technique to destroy cancer cells in the human body, is silenced. Dutch tv show Zembla investigates 911 theories (English subs). The Dutch public television program Zembla investigates the film "Loose Change" as mentioned above and concludes that some accusations in the film are not entirely correct, but that it's impossible to refute others.